This is the new version of the Naniwa Super Stone with new packaging. They are made with a new resin bond and a tighter control of grit particle size. This bonding agent gives the stones two distinct advantages. First, the resin bond allows for a higher concentration of abrasive particles compared with less expensive methods of stone bonding. The higher abrasive levels contribute to the speed and ease of sharpening. Second, these resin bonded stones don't require soaking in water prior to use, just a sprinkle on the top is all that is needed. Do not soak these stones! This particular 400 grit stone is excellent for establishing a new bevel angle or removing chips from the blade. This stone is the lowest grit you will need if you maintain your edges. 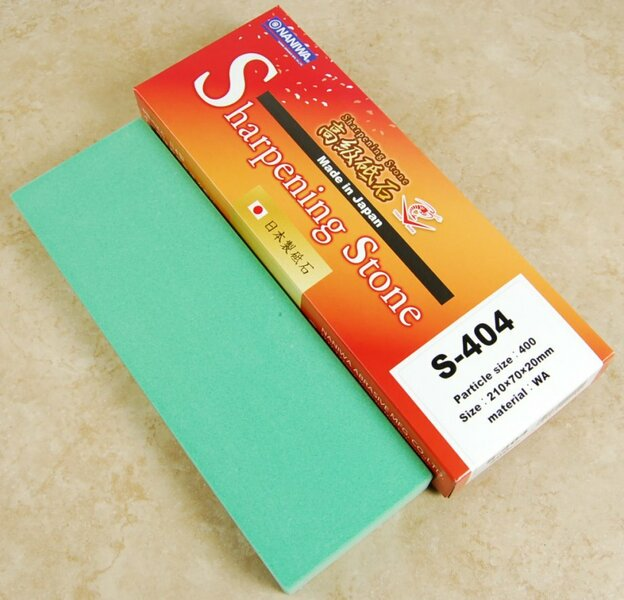 If your knife or tool is not damaged or allowed to get too dull between sharpening sessions this 400 would be the coarsest stone you would need. They measure 210 mm x 70 mm x 20 mm. We are happy to be the only US distributor of Naniwa Super Stones that come in the larger 20 mm thickness without bases. I got the 400 grit stone to fill in the gaps between the other Naniwa stones I have. The 400 is a good starting point for maintained blades. CKTG gets two thumbs up! I was a bit impatient to receive my products, however they arrived very quickly. The staff was very helpful as well. This stone has the feel of a little higher grit range however it will bring even the worst of dull knives back from dead. Make sure you know your angles and pressure when sharpening a knife as this stone does its work quickly. The packaging was wonderful and I probably could ha e punted the box across the yard and still not damaged the contents. The thin packing paper makes for a wonderful sharpness test when you finish sharpening. Will definitely return for future business. I love this stone! I put it through my entire knife bag after a busy holiday season. It's fast cutting, slow dishing, doesn't load up fast. I used German steel, blue #2, and white #2 with no issue. The scratch pattern is fine enough as a good thinning stone, that's easily buffed out as you move to a 1k. I bought this stone because the imanishi 400 was out of stock, and I'm not upset at all. Product was as good as advertised and came quick. I picked this stone up recently and used it to repair a buddies chipped chef's knife. It had a nice little notch in the blade after a dinner guest tried to "saber" a champagne bottle with it. I was impressed with this splash and go. Didn't take long to complete the repair. I'm glad I added it to my stone collection. The Stone was shipped out to me rather quickly, was packed with care and arrived in tact.This stone helps develop an edge rather quickly and give good feedback. A nice wide working surfacefor sharpening and holds water well. This stone is a fast and a smooth cutter, and I have used it on many very low cost German-style knives that have steel with a lot of pitting, and I've been able to rapidly get back to a good blade. It only takes about 10-15 swipes on this to completely reset a blade to the point that it can be polished up at higher grits. I just did a set of cheap to half decent German knives with this, switching to the Naniwah Super 2000 grit and the knives all went from dull to very sharp in very short order. I would have tried the Nubatama Bamboo 400 and the Naniwah 2K 'green brick of joy' for this type of work but CKTG were sold out at the time. Builds a swarf quickly and cuts quickly and very smoothly/uniformly. Very long lasting and harder to gouge than the 2000...in fact it doesn't gouge in my experience. While I have some 800-1200 grit stones, I feel like I don't need to use them when using this because it polishes up so cleanly and leaves a nice haze on the knife to assess the new edge. For already sharp edges it's too much, but for the 6-12 month neglected knife that can no longer cut paper or tomatoes...this is a go-to.